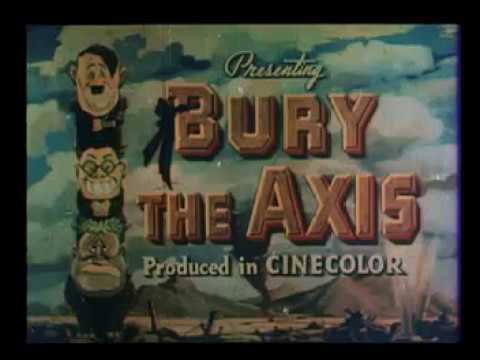 Bury The Axis (1943) - Released on February 3 1943 by Paramount Pictures, "Bury The Axis" is a stop-motion animated short film using clay figurines. The cartoon was directed and co-animated by American Lou Bunin along with Arthur Turkisher. It was made for the British as a way to show the evil of their enemies, as many British propaganda portrayed at the time. "Bury The Axis" humorously shows how Adolf Hitler, Benito Mussolini and Emperor Hirohito team together to conquer the world but in the end were defeated by the Allies.